We often wonder on how fast light travels and when we would actually see the photons travelling that fast. Well the researchers of MIT have created a camera that can shoot at ONE TRILLION FRAMES per SECOND. Isn't that Amazing!!. It is fast enough to capture light beam travelling from say the length of one litre bottle to its cap and reflecting back to the bottles bottom. This whole camera system is based on a technology called steak camera which has been recently built. Andreas Velten who is one of the system developers calls is the "ULTIMATE" in slow motion to which he is absolutely right. This camera is not small like the normal cameras but it requires a lot of settings and a lot more complicated one.So explaining it from the starting, the aperture is a narrow slit through which particles of light ie photons enter and are converted into electrons which then pass through an electric field and gets deflected by it. As the electric field is changing very fast, the electrons gets deflected corresponding from the late arriving photons. Thus the image produced by the camera is 2-D in the sense that one dimension represents the degree of deflection ie time and another corresponds to the direction of slit. As it produces a 2-D image which is a very serious drawback to produce an ultra slow motion movie. 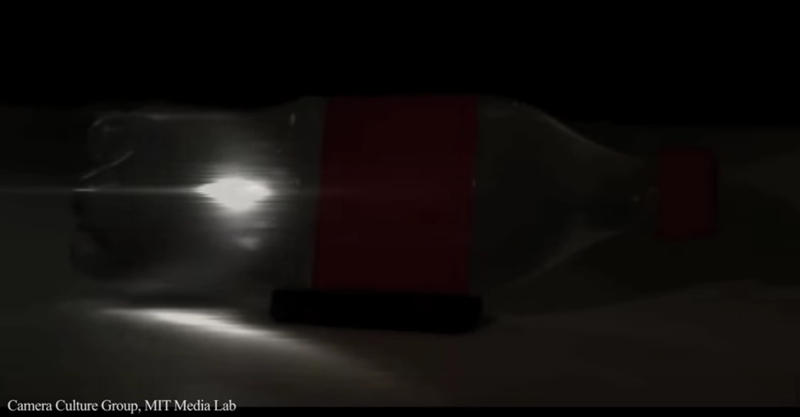 So to get a slow mo movie they must perform the same experiment ie passing the light pulse through the bottle again and again. It takes a nano second for light to scatter through a bottle but takes a full one hour to collect all the data. After accumulating 1000's of data sets each of which represents position of photon with their time of arrival, all of them are stitched together according to their time and then we get a full ULTRA SLOW-MO MOVIE. The price tag of steak camera along with the laser that generates light pulses was put around $250,000 by Bawendi, first one to research on quantum dots. The researchers in another project presented that this camera can also see around corners ie can see what is around another side of the wall, door etc. Well we may say that we can do this by radar or infrared, But we cant if the object is not emitting any thermal radiation. So this camera would pretty much work on this case. That camera works by bouncing light off a reflective surface say, the wall opposite a doorway and by measuring the time taken by different photons to return.But because the ultrafast-imaging system requires multiple passes to produce its videos, it can’t record events that aren’t exactly repeatable.